One thing that attracted me to interpersonal theory was that it can be used not only to describe behavior that occurs between people, but also to predict the dynamics of this behavior. Although from an interpersonal perspective, these behaviors often take the form of observable and unobservable actions between people (real and imagined), recent thought is increasingly linking the dynamics of the interpersonal field with the dynamics of the affective system (e.g., Hopwood, Pincus, & Wright, in press). The study of affective dynamics within interpersonal relationships is one of the prime research interests of Thomas Hollenstein and his research team at Queen’s University, whose work is the focus of this Expanding the Circle column. Echoing early interpersonal thought that parents help their children regulate emotionally (e.g., Sullivan, 1953), much of Hollenstein’s research has focused on how interpersonal relationships influence later interpersonal and affective functioning over the course of development (Hollenstein, 2007). One operationalization of these dynamics is affective flexibility, the coordinated affective expression of parents and children across state-space ranging from negative to positive affect. 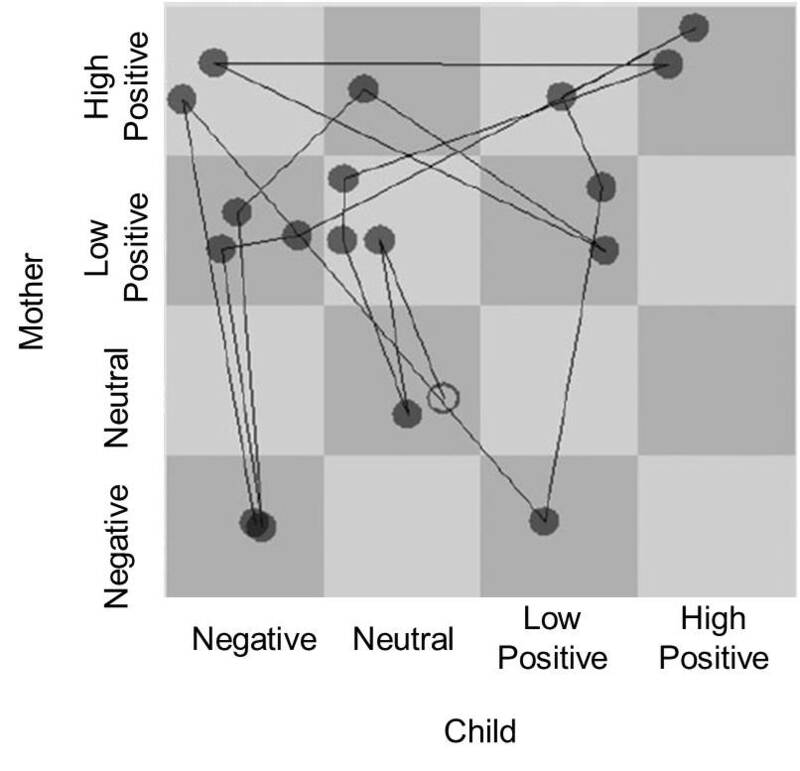 Parent-child dyads can range from being rigidly constricted in their emotional expression (see Figure 1) to exhibiting a wide array of dyadic pairings of affective experience across the state-space grid (Figure 2). Hollenstein and his team proposed that affective flexibility demonstrated within the parent-child relationships would teach children to better modulate their emotions, in turn leading to better management of affect outside the dyad. Figure 1. Example of low affective flexibility (modified from Lunkenheimer et al., 2011). Figure 2. Example of high affective flexibility (modified from Lunkenheimer et al., 2011). Hollenstein and his colleagues (Lunkenheimer, Olson, Hollenstein, Sameroff, & Winter, 2011) assessed affective flexibility in parent-preschooler dyads (N = 257). They coded children’s and parents’ expression of affect during a video-recorded lab test (collaborative completion of a block design test using a moment-to-moment behavioral rating protocol and deriving a score of overall affective flexibility composed of the range, dispersion, and transitions of affect expressed) for each dyad and evaluated the effect of affective flexibility on several affective and affect-related behavioral outcomes. The results of their study indicated that high affective flexibility was associated with lower externalizing problems (as rated by mothers), even when other factors such as children’s negative and positive affect, effortful control (as assessed in a series of other lab tasks), and history of externalizing behavior were taken into account. High affective flexibility also amplified the effect of children’s positive affect on reducing teacher-rated externalizing behavior. Moreover, these results were consistent regardless of whether the parent in the interaction was the child’s mother or father. Hollenstein and his team have demonstrated the importance of affective flexibility within parent-child dyads in predicting important psychological and behavioral outcomes throughout a range of developmental periods stages, from infancy (Svravish, Tronick, Hollenstein, & Beeghly, 2013) to adolescence (van der Giessen et al., 2014). In these and other studies, Hollenstein emphasizes that like interpersonal dynamics, affective dynamics are best conceptualized in terms of dynamic systems. Accordingly, he advocates the measurement and modeling from a dynamic systems framework. For example, he and his colleagues advocate the use of state-space grids as a way of capturing the systematicity of affective dynamics (e.g., Hollenstein & Lanteigne, 2014). Perhaps not surprisingly, this emphasis on the dynamic assessment and analysis of affective functioning coincides with recent interpersonally oriented research examining interpersonal functioning from dynamic perspectives (e.g., Lizdek et al., 2012; Mainhard et al., 2012; Roche, Pincus, Hyde, Conroy, & Ram, 2013). The use of square grids rather than circles notwithstanding, these two threads of research have much in common. In both content and method, Hollenstein and his research team’s research provides a useful complement to the work of many SITAR members. Namely, their work highlights the important affective ramifications of interpersonal interactions, thus indicating a direction for future inquiry and collaboration. Hollenstein, T. (2007). State space grids: Analyzing dynamics across development. International Journal of Behavioral Development, 31(4), 384-396. Hollenstein, T., & Lanteigne, D. (2014). Models and methods of emotional concordance. Biological Psychology, 98, 1-5. Hopwood, C. J., Pincus, A. L., & Wright, A. G. C. (in press). The Interpersonal Situation: Integrating clinical assessment, formulation, and intervention. In D. B. Samuel & D. Lynam (Eds. ), New York: Oxford University Press. Lizdek, I., Sadler, P., Woody, E., Ethier, N., & Malet, G. (2012). Capturing the stream of behavior a computer-joystick method for coding interpersonal behavior continuously over time. Social Science Computer Review, 30(4), 513-521. Lunkenheimer, E. S., Olson, S. L., Hollenstein, T., Sameroff, A. J., & Winter, C. (2011). Dyadic flexibility and positive affect in parent–child coregulation and the development of child behavior problems. Development and Psychopathology, 23(2), 577-591. Mainhard, M. T., Pennings, H. J., Wubbels, T., & Brekelmans, M. (2012). Mapping control and affiliation in teacher-student interaction with State Space Grids. Teaching and Teacher Education, 28(7), 1027-1037. Roche, M. J., Pincus, A. L., Hyde, A. L., Conroy, D. E., & Ram, N. (2013). Within-person covariation of agentic and communal perceptions: Implications for interpersonal theory and assessment. Journal of Research in Personality, 47(4), 445-452. Sravish, A. V., Tronick, E., Hollenstein, T., & Beeghly, M. (2013). Dyadic Flexibility during the Face-to-Face Still-Face Paradigm: A dynamic systems analysis of its temporal organization. Infant Behavior and Development, 36(3), 432-437. Van der Giessen, D., Hollenstein, T., Hale III, W. W., Koot, H. M., Meeus, W., & Branje, S. (2014). 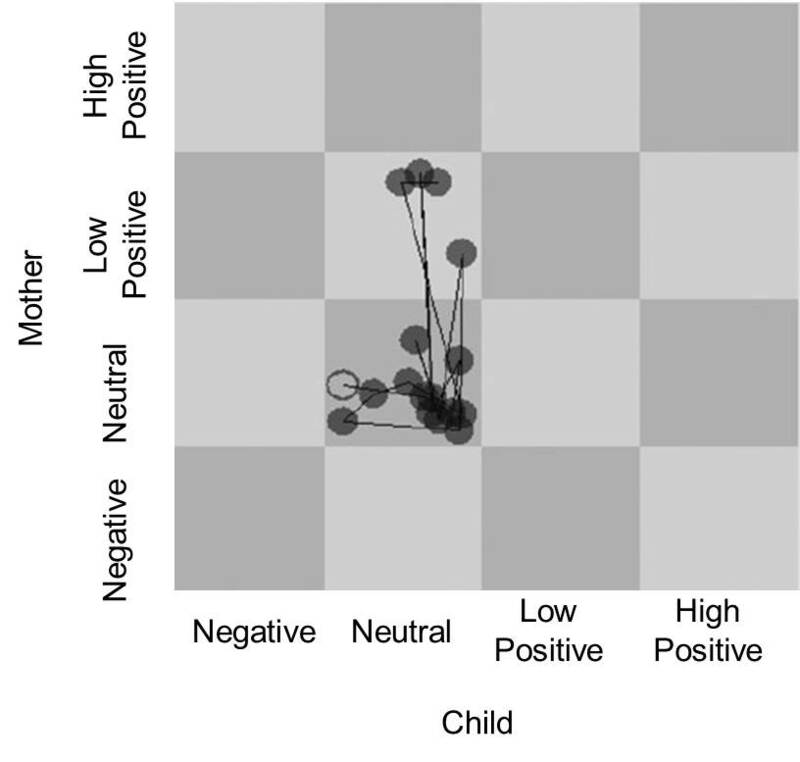 Emotional variability in mother-adolescent conflict interactions and internalizing problems of mothers and adolescents: dyadic and individual processes. Journal of Abnormal Child Psychology, 1-15.